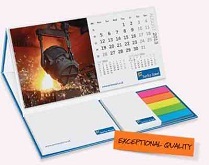 Exposure is the key to your success and our brand new latest Custom Calendar Pod Desk Post-it Calendars are just the tool to get your name out and about in a practical way that is sure to make a good impression. Our 210 x 420mm CalendarPod™ holsters 4 exceptional features that absolutely no office should go without: a personalised bespoke calendar with 12 pictorial inserts, a 50 sheet A7 sticky note pad, a 50 sheet A8 sticky note pad and 25 sheet index tabs - all logo branded with your Company branding!! Individually packaged in self seal bags and ready to hand out to customers, why not hand out as many as you can and increase your profit margin whilst gaining valuable brand-name exposure to more and more potential customers? For a FREE QUOTE, please fill in the form regarding our Custom Calendar Pod Desk Post-it Calendars and we'll be able to help you.